Today was a family day! Since T and I are leaving at some ungodly hour Friday morning to take our much needed annual family vacation to Canada and we can’t take them with us this year, we wanted them to have a little vacation day of their own. 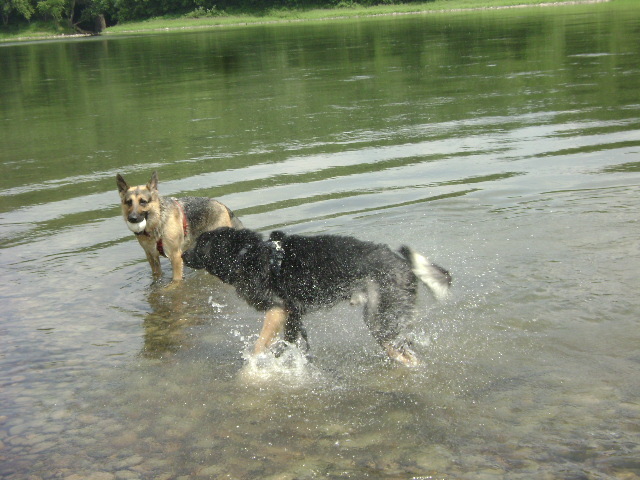 We took Jury and Ruka to our spot at the river for some swim time and then we went for lunch! Our first stop was our little river spot. 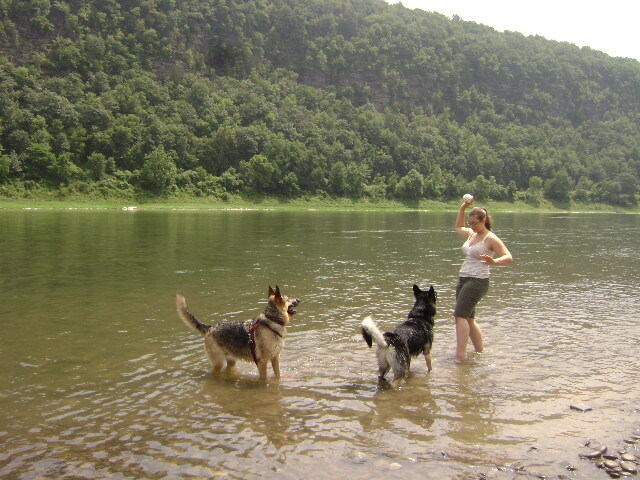 Now some of you might think it’s strange to go to a river to swim, but T grew up swimming in the river (in the same spot we go to now actually) and so she has an affinity for it and I don’t mind it either (of course I prefer a lake or the creek, there is no/much weaker current and being swept away by the current isn’t something I would like to experience). Ruka loves the water and has ever since the first time we took him swimming. I’m not kidding. Whether it is 10 degrees or 90 degrees, icy cold or hot and humid, he will find water and throw himself in it. This dog would live in the water if he could. Jury is just starting to become more use to the whole swimming thing, since we usually take Roo when we go anywhere with water. 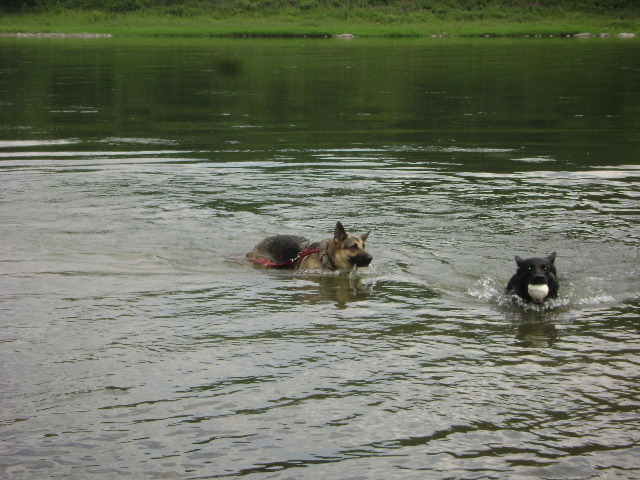 She has gotten much better at swimming out farther to fetch their water ball, but Ruka usually always gets there first (I swear he’s part cheetah!). Jury would just prefer to hold the ball in her mouth, drop it into the water, watch it float downstream a bit, the catch up to it and pick it up again. She’s very good at entertaining herself, but she likes to race for the ball too. So we threw to ball for them for about an hour until we were too hungry to play anymore. Once we got so hungry we couldn’t stand it anymore. We piled in the car, some of us dripping wet (dogs) and some of us regretting not letting the others dry off first to avoid a stinky car (us) and drove to one of our little lunch places for something yummy to put in our tummies. T had a delicious pork barbeque sandwich on a hard roll and I had a delectable honey roasted turkey panini with swiss cheese, fresh tomatoes, crispy bacon and a honey mustard sauce on crusty ciabatta bread and we shared an order of French fries. YUM! Jury and Ruka enjoyed a baby cone of soft vanilla ice cream. Well actually Jury only ate the ice cream that was on top of the cone, while Ruka devoured his entire ice cream and then finished of Jury’s cone. He goes crazy for ice cream while she could take it or leave it. There are no pictures from lunch because my hands were too messy and sticky to hold the camera. Ha-Ha! With full and happy bellies, we headed for home. Now we’re driving on a nice country back road (you know the kind where you’re not really sure of the speed limit and yet people drive like crazies anyway) and after we come around a turn I see something on the road in the other lane. 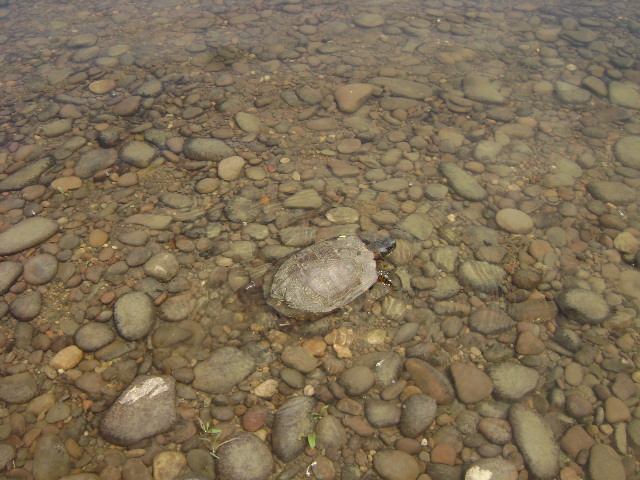 At first I thought it was something dead, but as I drove by and looked over anyway (because you know you just have to) I was surprised to see that it was a turtle! A turtle just randomly crossing the road in the countryside. You sure don’t see that every day. Not twenty feet after we passed the turtle by a truck came speeding up the road and I had to flask my lights at him so he would slow down and hopefully not crush the poor turtle. So of course, T had me turn around to go and save him. 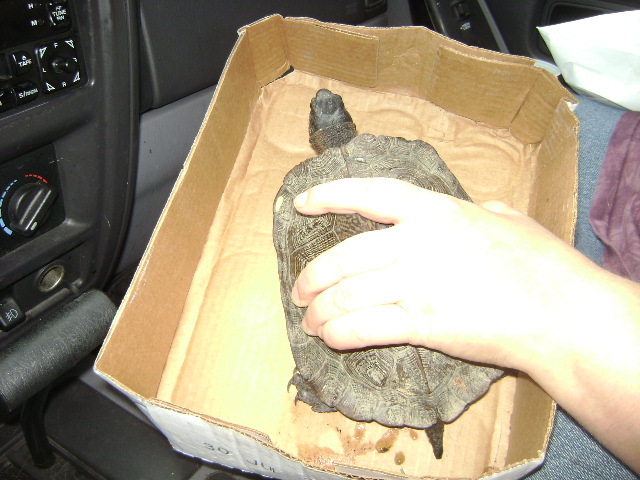 I picked him up, put him in a box and drove him down to the river by our house and set him free. He was quite happy and even popped his head up out of the water to say Thank You (at least that’s what T thought he said, he could have been cussing us out for all we know). T named him/her Roxy. 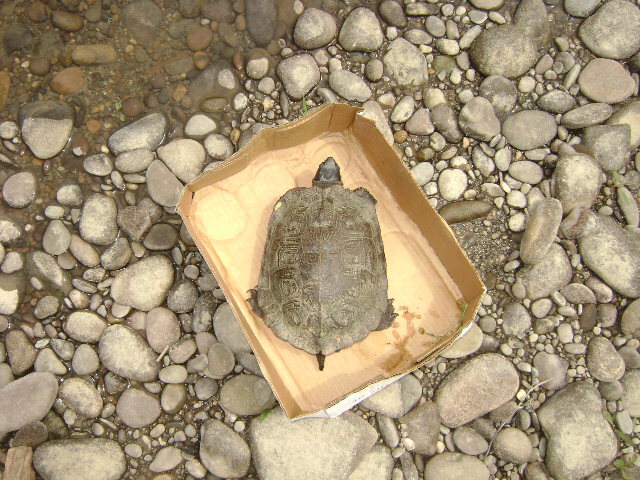 Roxy the Turtle set free!!!! Hi! You posted that you’re in our area. We haven’t met many lesbians in this area. Where are you guys at?